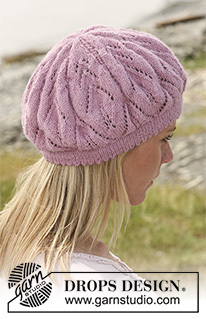 Nothing could be simpler than this single crochet beret, this model done in Lion Brand Cotton-Ease on size G and H hooks. Cotton has enough body to prevent the hat from sagging. – I hate wearing droopy berets that look too big, though slouchy is is style now. You may have to sign in at the website to access the download. This beauty is labelled a “Basque” hat on the website. I’ve only recently begun wearing berets – they don’t crush my hair but do keep me warm, and my husband, not a fan of hats in general, thinks I look nice in them. But I don’t like them too floppy. Once I made one that reminded me of Fat Albert. Not a pretty sight.